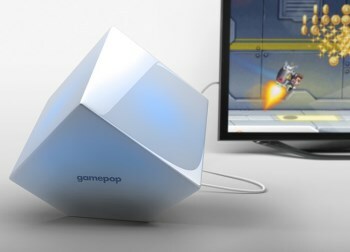 Gamepop is an upcoming subscription-based service that promises to bring mobile gaming to your television for just seven bucks a month. Hot on the heels of the Ouya's "success" - which I put in quotes simply because the ability to find funding isn't necessarily an indicator of how it will perform on the mass market, which has yet to actually see the thing - comes Gamepop, promising to put 500 mobile games on your television for $6.99 a month. The console includes its own wireless controller or you can use your iPhone or Android as a motion controller, and the announcement video promises that the Gamepop library will be constantly updated with new mobile titles. And if you preorder before the end of May, the whole thing is free. Free! Before you open your wallet and take out your credit card, however, it might be prudent to ask a few questions. First, how much will the console cost after May? The website does not say. What if you decide you're tired of it after a couple of months? According to the terms and conditions, you may cancel your contract at any time but will be on the hook "for all fees, charges, and other amounts incurred and owed under your Agreement along with any applicable ETF [early termination fee]." How long is the contract? Does not say. How much is the ETF? Does not say. What games are in the library? Does not say. If the game library is all Android, why is the first phone to appear in the promotional video an iPhone? I don't know. Why does the website advertise a flat $6.99 monthly service fee while the T&C implies that multiple service plans, presumably with multiple levels of service at multiple costs, are available? Couldn't say. Should you give these people money? Up to you, but in similarly speculative situations on Kickstarter and Indiegogo I have always counseled "buyer beware," and if I could I would be screaming it in your face right about now. We've reached out to the Gamepop folks for more information and will share whatever we come up with, and in the meantime you can dig into it a bit more yourself at gamepop.tv. UPDATE: We've actually received two responses from the Gamepop people regarding contract terms and return policy. The first came from John Gargiulo, business development and marketing guy at Gamepop parent Bluestacks Systems, who said on Twitter that the console is free through May, comes with $200 of "top paid games," can be returned anytime and is yours to keep after a year of the $6.99 monthly fee. In an emailed response, however, a Gamepop support rep further clarified that customers who cancel and return the equipment "in good working condition" within 30 days of the original shipment will be subject to a $25 restocking fee; customers who cancel after 30 days will be hit with a $100 restocking fee. The $6.99 service fee is currently the only service option available, and while it sounds like other plans will be introduced after May, nothing official has been announced. Gamepop's return policy is available in full here.